At 555 feet high the Washington Monument towers over the National Mall. In a city of height-restricted buildings, this enormous, mottled-marble obelisk can be seen piercing the sky from miles around like a beacon to the country’s symbolic center. Once there, the observation deck at the top of the monument provides visitors with a breathtaking bird’s eye view of the city – from the World War II Memorial, past the Lincoln Memorial and over Arlington Bridge to the west, down the museum-lined Mall to the Capitol Building to the east, over the Ellipse and past the White House to the north, and beyond the Tidal Basin and the Jefferson Memorial into Virginia to the south. Built to honor the country’s first president, the Washington Monument is the linchpin of an evolving American narrative told through the buildings and monuments that surround it. Pierre Charles L’Enfant, the architect and city planner responsible for the design of Washington D.C. and the National Mall, was the first to propose a monument to Washington. Inspired by the city planning in his native France, L’Enfant suggested placing an equestrian statue of George Washington as commander of the Continental Army in the middle of the National Mall. It was to be set on the spot where the sight lines from the White House and the Capitol intersected so that future presidents and members of Congress would always have Washington in view and on their minds as they deliberated on what was best for the country. Funding fell short for L’Enfants’ grand scheme, however, and his sculpture was never completed. 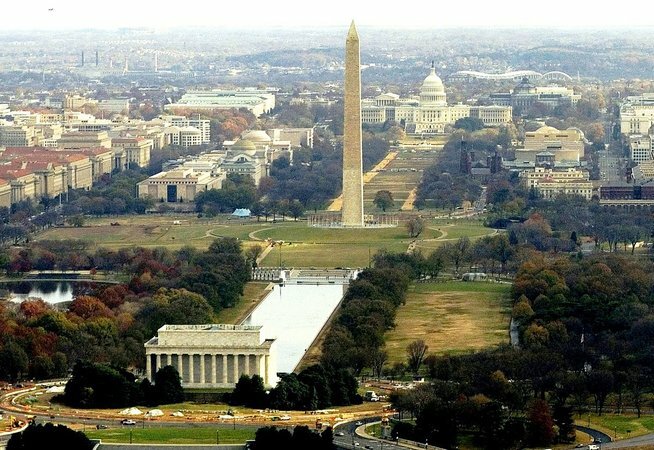 Fifty-four years later, Federal architect Robert Mills put forward plans to celebrate Washington with a 600 foot tall Egyptian-style obelisk surrounded by a vast colonnade decorated with sculptural elements recalling ancient Egypt, Greece and Rome. Unlike a true Egyptian obelisk which was carved from a single block of stone, the one Mills proposed would be made of many marble blocks some carved with portraits of the first president in action. Its grandeur would serve to equate George Washington with the greatest leaders of antiquity. With a modest amount of private funding in hand, Mills began work on the obelisk thinking he would be able to raise the rest. However, the venture did not go as planned. 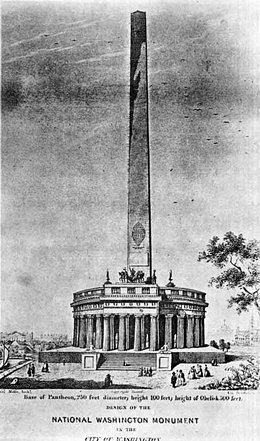 By 1851, the marble shaft of the obelisk was only one-quarter complete. It stuck up like a great stump and became a symbol for the government’s poor planning and mismanagement of the Mall. The Monument’s Board of Managers lobbied Congress for money but was soon overthrown by a group of anti-immigration, anti-Catholic activists called the “Know-Nothings”. The Know-Nothings wanted to use the monument to promote their “America for Americans” agenda by having the monument paid for and built by those who supported their cause. However, the oncoming Civil War drained interest from the project and the Washington Monument remained stump-like for more than a quarter century. Then, in 1878, Congress appointed Lieutenant Colonel Thomas Lincoln Casey, an army engineer, to complete the project. 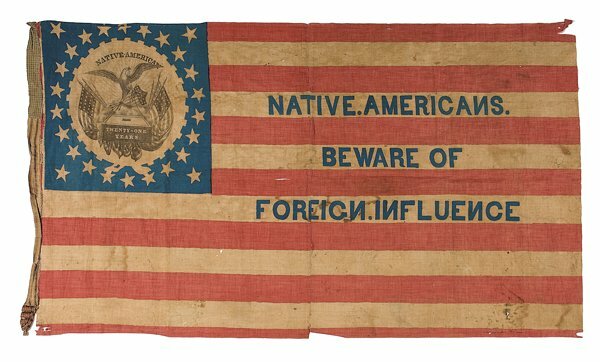 A flag representing the ideas of the Know-Nothing Party, originating in 1849 and active throughout the 1850s. Colonel Casey jumped into the project by significantly altering Mills’ plans. Right away he simplified the design of the obelisk, stripping the structure of extraneous decoration, and creating a narrower, higher, peak at the top. Using a white marble that was a better quality, but not an exact match of the first stone used, Casey completed the monument. And while Congress gave Casey money incrementally and tried to intercede in the design process, they failed to get the Colonel to alter his vision of a façade free of any and all ornamentation. In 1884, over widespread objections about its lack of descriptive, narrative and historical elements, Casey completed the memorial. 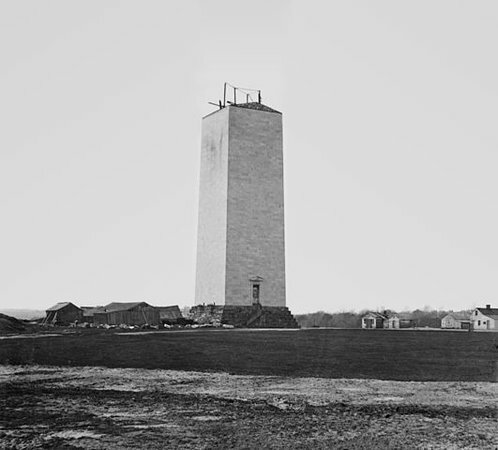 In the end, it had taken more than three dozen years for the Washington Monument to be completed. Soil stability issues forced its move some 400 feet from the exact intersection point for the Capitol and White House. Funding shortages, politics and the intrusion of the Civil War delayed its completion. But what does it actually tell us about Washington? Unlike the other monuments on the Mall, the Washington Monument says next to nothing about the subject for whom it was created. In contrast, one can learn a lot about Lincoln from visiting the Lincoln Memorial, viewing his sculptural likeness and reading his words inscribed on the walls. And a person can learn a lot about World War II by visiting that Memorial and studying the reliefs, inscriptions, sculptures and other symbolic features. But one cannot learn anything about the way Washington looked or his words or deeds by visiting the Washington Monument. And that is a result of the long and contentious process from which the Monument to America’s first president arose. 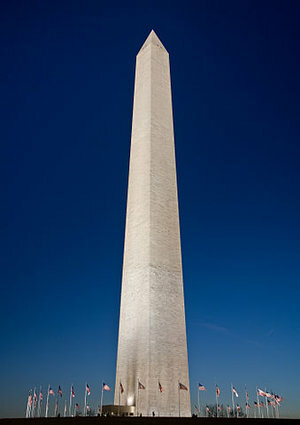 The Washington Monument receives an estimated 4 million visitors a year. 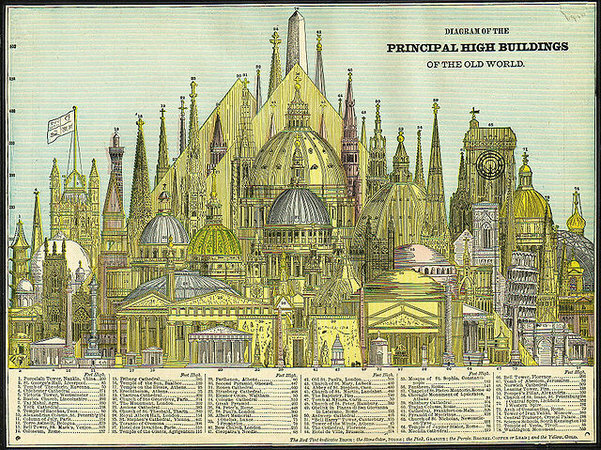 It was the tallest building in the world until the completion of the Eiffel Tower in 1889, and remains the tallest stone building in the world today. Cite this page as: Julia Langley, "Robert Mills and Lieutenant Colonel Thomas Lincoln Casey, Washington Monument," in Smarthistory, August 9, 2015, accessed April 20, 2019, https://smarthistory.org/robert-mills-and-lieutenant-colonel-thomas-lincoln-casey-washington-monument/.